Are you introducing ultrasound as a new technological solution for your liquid processing application? If so, some terms used in the ultrasonic industry may be unfamiliar. With this in mind, we are launching a series of blog posts that will cover the most common ultrasonic equipment and processing-related terminology. 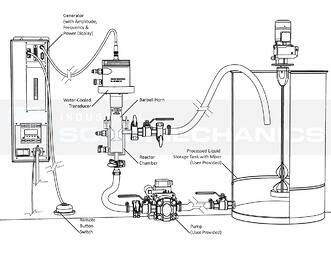 This first post will focus on the terms used to describe the main components of an Industrial Sonomechanics (ISM) ultrasonic liquid processor and show you how these components work together. ISM ultrasonic liquid processors comprise four main components: Ultrasonic Generator, Piezoelectric Transducer, Barbell Horn and Reactor Chamber. 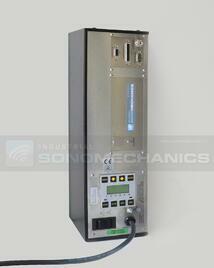 The Ultrasonic Generator is the brain and the heart of an ultrasonic liquid processor. It transforms 115 V or 240 V AC line power into a signal with a frequency near 20 kHz that drives the Piezoelectric Transducer. 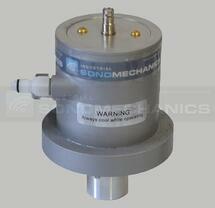 Automatic frequency tracking and adjustment is utilized in order to ensure optimal on-resonance operation. The Generator can output any electrical power up to its rating value: 500 W for the LSP-500, 1200 W for the BSP-1200 and 3000 W for the ISP-3000 processor. The power is automatically adjusted based on acoustic load conditions (e.g., ultrasonic amplitude setting, liquid viscosity and pressure, Barbell Horn immersion depth, etc.). A similar principle is used in the cruise control of a car, where engine power output is automatically increased when going uphill. The Piezoelectric Transducer (also called “Ultrasonic Converter” and “Langevin Ultrasonic Transducer”) is an electro-mechanical component, which converts electrical energy coming from the Ultrasonic Generator into mechanical energy in the form of ultrasonic vibrations with the maximum amplitude of about 20 - 25 microns. These mechanical vibrations are then transmitted to the Barbell Horn for amplification and delivery to the processed liquids. There are several types of high-efficiency (93 - 97%) piezoelectric transducers that are used as parts of ISM's laboratory, bench and industrial-scale ultrasonic liquid processors. Besides standard air-cooled Transducers used with its LSP-500 processors, ISM offers medium and high-power water-cooled Transducers with its BSP-1200 and ISP-3000 systems. These devices are sealed to the outside environment and suitable for high-humidity conditions as well as for processing flammable materials, such as fuels and organic solvents. 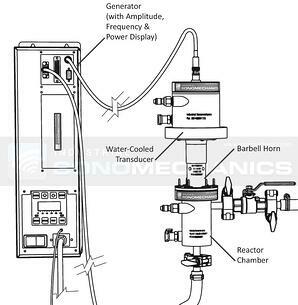 The Barbell Horn (also called Barbell ultrasonic horn, sonotrode or probe) is the component that amplifies the amplitude of ultrasonic vibrations coming from the Transducer and transmits them to the liquid being sonicated. Conventional ultrasonic processors utilize horns that can only provide high ultrasonic amplitudes when their output tip diameters are small, which makes them appropriate for laboratory studies, but not for industrial-scale applications. Process scale-up requires switching to horns with larger output tip diameters, able to output the ultrasonic energy into substantial volumes of working liquids while still maintaining high amplitudes. Barbell Horns are designed to do just that. The Barbell Horn is at the core of ISM's Barbell Horn Ultrasonic Technology (BHUT), which allows for direct scale-up of high-amplitude laboratory-optimized processes to industrial levels and guarantees reproducible and predictable results. For more information on BHUT, please see this video. 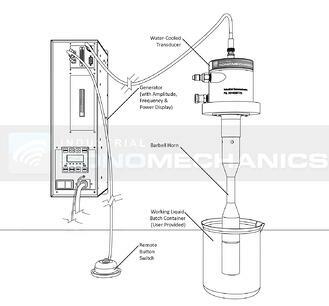 With the use of a Reactor Chamber (flow cell), an ultrasonic system can be configured for continuous liquid processing in a "flow-through" mode (see below). When a large amount of material needs to be processed, this arrangement is preferable to the "batch" mode because it results in a much higher processing capacity, improved ultrasonic exposure uniformity and better temperature stability. The Reactor Chamber can include a water-cooling jacket to help maintain the temperature of the working liquid at a desired level. During continuous ultrasonic processing, the use of a properly designed Reactor Chamber ensures that all working liquid is directed through the active cavitation zone (the area where the liquid gets "processed") created by the incorporated Barbell Horn, resulting in homogeneous processing and a high-quality product. Ultrasonic liquid processors can be used in flow-through and batch modes. A schematic of the recirculating flow-through configuration is presented on the left. This configuration is commonly used at the bench and industrial scales, but can be used at the laboratory scale as well. The working liquid is drawn from the bottom of the storage tank by a pump and supplied to the Reactor Chamber through its bottom sanitary-flanged inlet. Inside the Chamber, the liquid is exposed to ultrasonic cavitation, after which it flows out of the Chamber's sanitary-flanged outlet and back into the tank. The material passes through the Chamber multiple times, which increases the exposure time, improves processing uniformity and allows for precise temperature control. Batch-mode processing does not require the Reactor Chamber. In this mode, the processed liquid is contained in a batch container or a reservoir that may already be a part of the setup used in the process. The main advantage of this configuration is its simplicity. The disadvantages include temperature control difficulties, potential processing homogeneity issues (independent stirring may be necessary) and processed liquid volume restrictions.